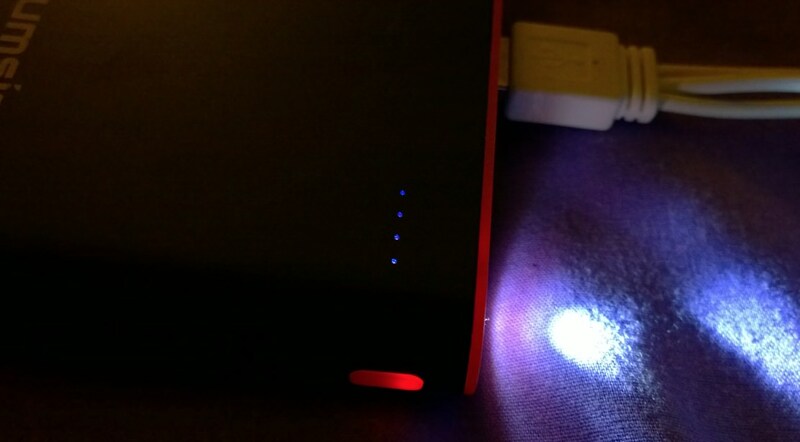 Once every couple of months, I rave about a new power bank as the best thing since sliced bread. However, I justify this by pointing out that technology moves on and power banks have been adapting at each stage. 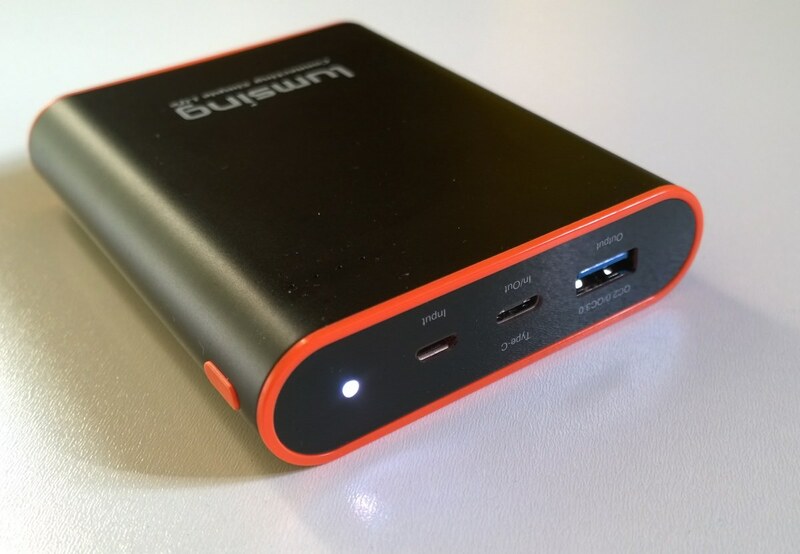 I'm very picky about what I accept for review, and this Lumsing gadget has both microUSB and Type C input, plus USB-A QuickCharge 2.0/3.0 and Type C output, all in a compact and robust metal body with terrific internal capacity. What's not to love? the metal casing is slippery as heck and, given the 270g weight, the Grand A2 Plus is surprisingly easy to drop (I've had a few near misses). the status LEDs on the top surface are in the traditional 25% increments, but given that we'd started to get used to modern accurate readouts (e.g. here), it's disappointing to still not know whether there's (for example) 51% or 74% left in the tank. Moreover, the LEDs aren't even mentioned in the accompanying 'User's Manual'. This is somewhat unforgiveable - as an enthusiast I know what the LEDs (kind of) mean, but the average user will be confused. However, don't let that ruin the overall impression of a slick and professional 2016/2017 power bank. I was reviewing the black and orange variant, but you can also get this in silver and blue, and in gold and white. All are priced at £26 inc VAT in the UK, which is great value - plus see the end of this review for £5 off if you're quick. a USB-A socket that's wired to cope with QuickCharge 3.0, 2.0 and traditional USB currents and voltages. The internal blade is coloured blue as a visual clue that this is an 'extra capability' USB socket and typically you'd connect your USB-A lead that came with your particular smartphone - in my house, the only thing that's QuickCharge 3.0-compliant is the HP Elite X3 and this did indeed charge from this port and very quickly indeed - the Grand A2 Plus can output 36W via this jack under optimal circumstances! a microUSB socket for topping up the power bank from an 'old' style microUSB cable/mains charger. Yes, USB Type C is clearly the future (heck, even Apple just went all-in on Type C with their new Macbook range), but microUSB chargers will be around for another five years at least, so this accessory has got both bases covered. This port also accepts 2.5A input. You can use the two outputs at the same time, within reason. 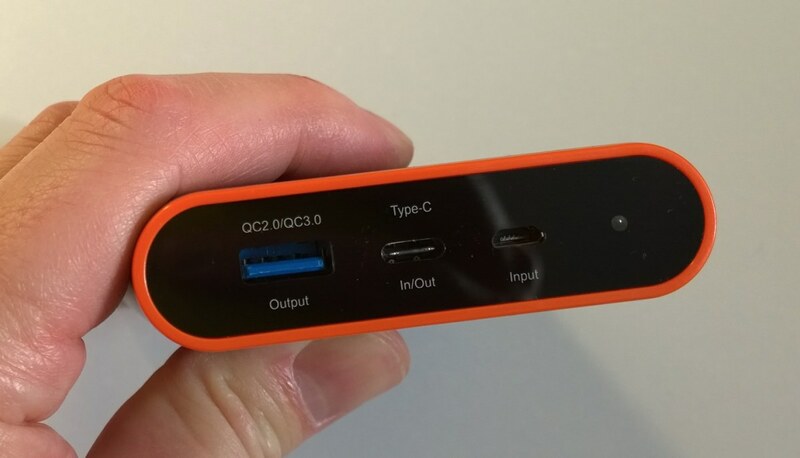 High current Type C output and full-on QC3.0 output both at the same time are possible but probably stretch the electronics a little. Things start to get a little fuzzy with modern chargers, since there's built-in intelligence, for example with QuickCharge there's automatic voltage ramping to optimise the charge cycle. The idea here is to trust the electronics. Lumsing says "Just plug things in and let us handle the rest. Don't worry about overheating, over-current and all those other nasty problems. We have you covered." Which is fair enough and at no point did the accessory get hot or cause me any concern. One casualty of the 'smart' in/out system is that you can't use the Grand A2 Plus in a 'pass-through' situation, i.e. you can't charge it and also pass through current to one of its outputs at the same time. This is a minor point though, and to be expected. After all, the Type C input is also an output and there must be a firmware switch inside that has to decide which mode the accessory is 'in'. 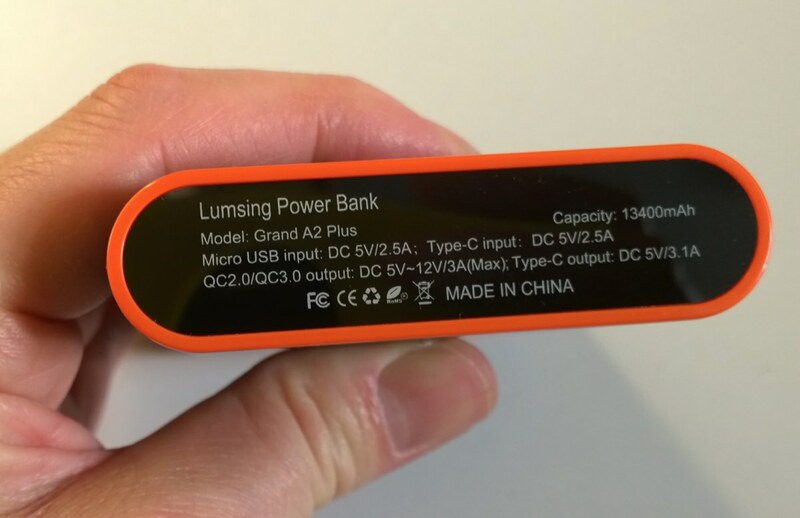 In terms of capacity, the Lumsing Grand A2 Plus is rated at 13400mAh, though as usual with power banks, this is at 3.7V, the internal voltage and delivered power at 5V will be around 10000mAh. Minus the usual conversion losses (e.g. heat), these accessories nornally lose around 20% power in the voltage change and current transfer. Minus another 20% for the voltage step down again in the phone from 5V input to actual battery voltage (4.2V max). These sums are pretty standard though, they apply to all such power banks. The bottom line is that a nominal '13400mAh' quoted capacity works out at more like 8000mAh delivered and registered charge into your smartphones, all under optimal circumstances. Which still seems like a sweet spot in a multi-device environment. This is enough to fully charge two 2016 phablets from scratch on a single power bank top-up. And the form factor of the accessory is deliberately minimalist, designed to stow away in any pocket or the corner of a briefcase. I did have a few issues with a couple of W10M Fast ring Lumias taking a couple of connection attempts and cable experiments to start charging, but I'm placing the blame for this firmly at W10M's feet, since every other phone type/OS I tried started charging immediately. So, the Grand A2 Plus is a solid and flexible power bank to take the smartphone owner into 2017 and keep them 'going'.